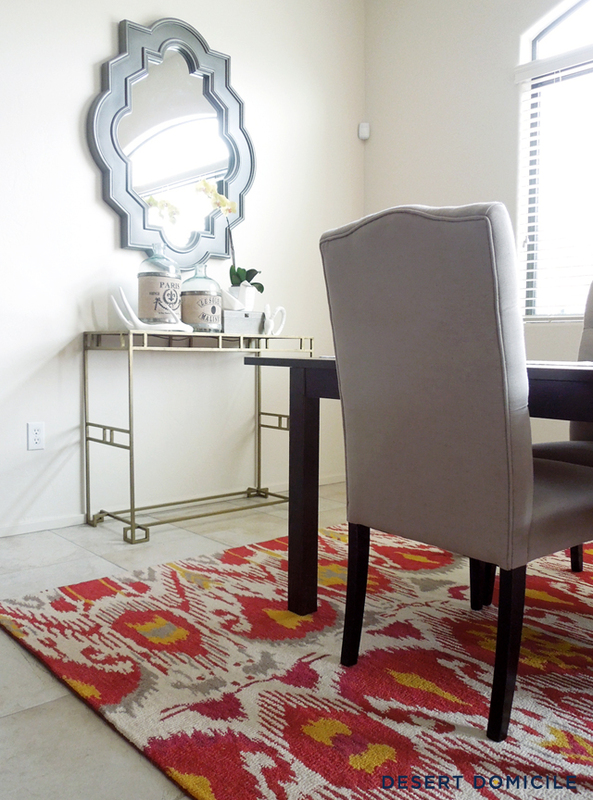 I made some changes to our dining room over the weekend! Remember how I've mentioned a million times that we need a rug for the space? Well, I think we've found one! If you follow me on Instagram (@desertdomicile), you've probably already seen the table. 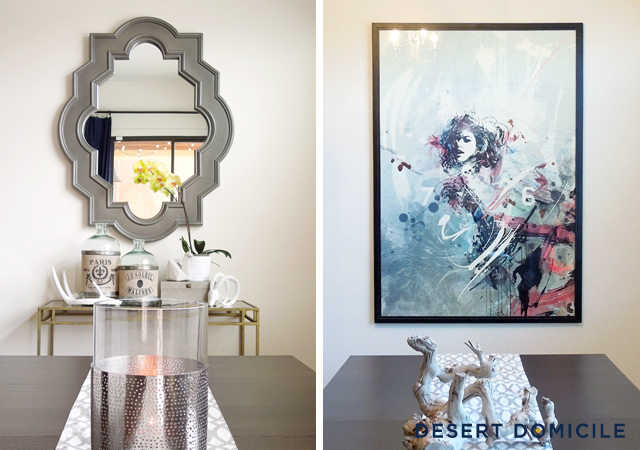 I had initially planned on putting it in our foyer but it was a little too deep and it felt out of place in the space so it got moved to our dining room. The table was a little expensive ($200) but after a little research, I found out that it's a designer piece that retails for ... wait for it ... $769!!! Yeah, I can't believe it either! Based on the image above, I think my table was supposed to have a glass insert on the bottom but it doesn't so I'm assuming it didn't come with one or it was broken at the store. It doesn't bother me at all but if I wanted to create a bottom shelf later on down the road, I could always have a piece of glass cut for $30 or so. 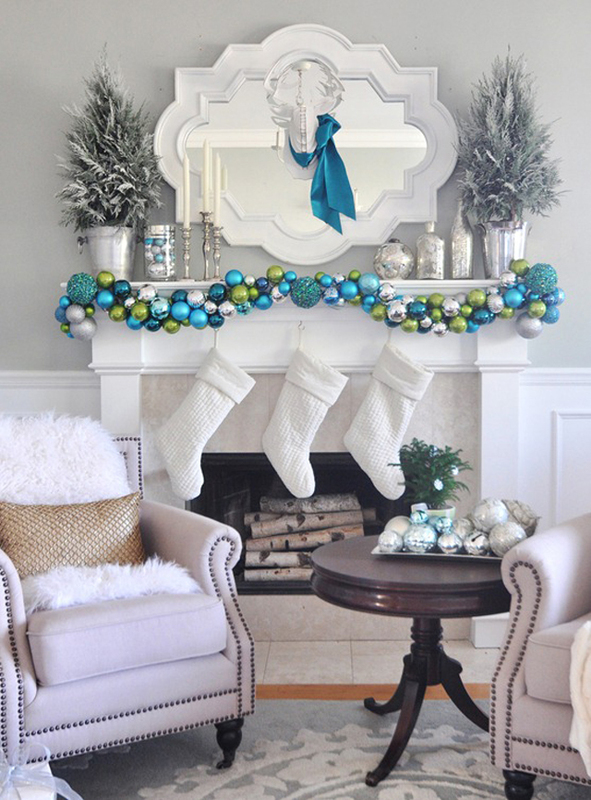 After I brought it home, I realized that it's the same mirror Centsational Girl has hanging horizontally above her fireplace! What do you think of the changes? Should I leave the mirror as-is or paint it? Can you believe the deal I got on that table?! Sorry to hear about your bad week! Is your puppy ok? 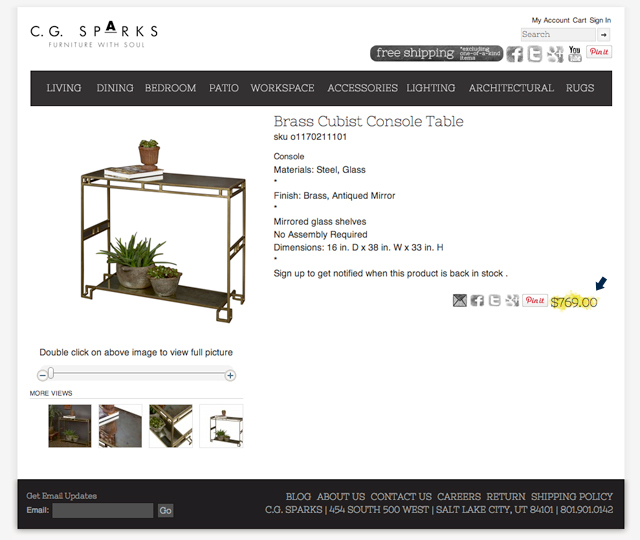 The mirror looks great and I can't believe the console table, what a deal! I love it without the bottom shelf. I'm sure whatever color you decide to paint the mirror will look great. It is definitely a big improvement for the room! I love the mirror and if you want to know my opinion, I would paint it navy. Dunno if it makes sense, but based on the image you posted, it makes the space look more sophisticated! I love it in the emerald green!!! And I love that table!! 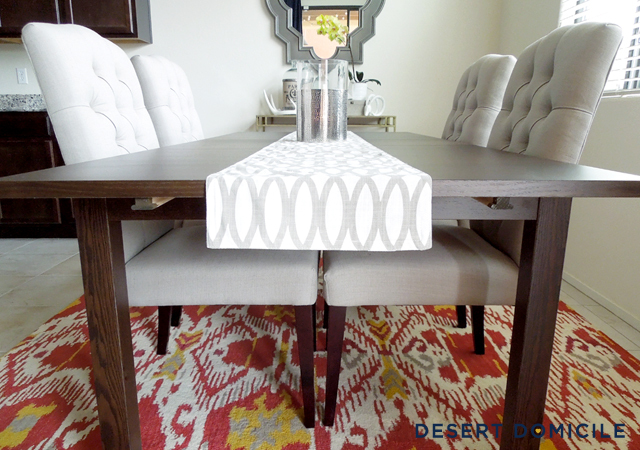 I love that table and the rug seems to fit perfectly under there. I can't decide if I'd like the emerald or navy better with the rug. I think either would be great! Hope everything is okay now! What a great find on that table and mirror. I love it in the navy. Everything looks really great!! Julia - Yes, he's ok! I think he was rebelling from me going back to work after having 11 days off over the holidays haha Thankfully none of the cords were plugged in so he didn't get a shock! Gretchen - Thanks! 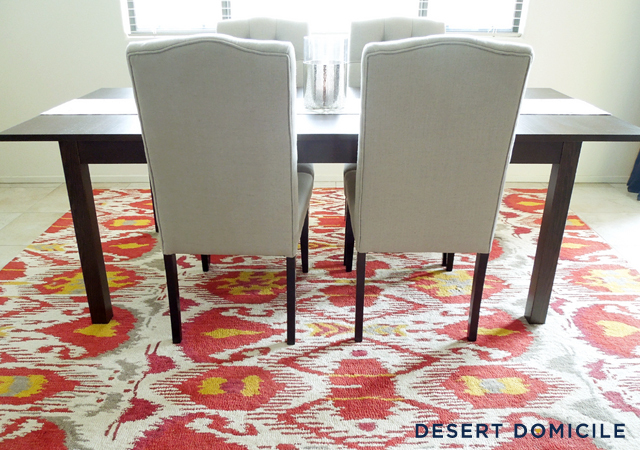 The rug color definitely spices things up! Courtney - Thanks! I know, can you believe it?! My jaw dropped when I found the CG Sparks one! 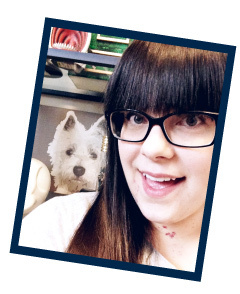 Officially a new follower of your awesome blog! I love the rug! 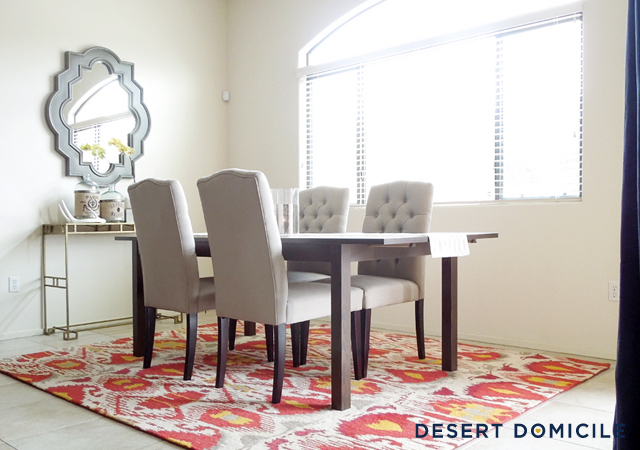 Have you thought about painting the mirror a color to tie into the rug? I'm sure whatever you choose will look awesome. Great find on the console. 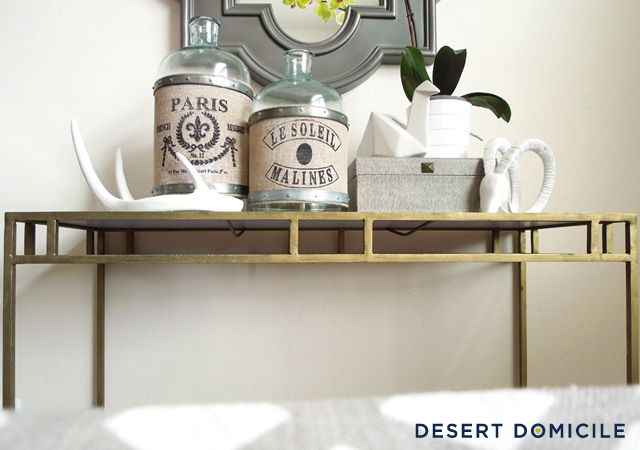 I like the metallic touch it adds to the room. Okay you've really got to stop making your room all complete and everything. You're making us look bad! ;) I love the rug in there. The table + console vignette is fantastic. Our Next Great Adventure - Awww, thanks! 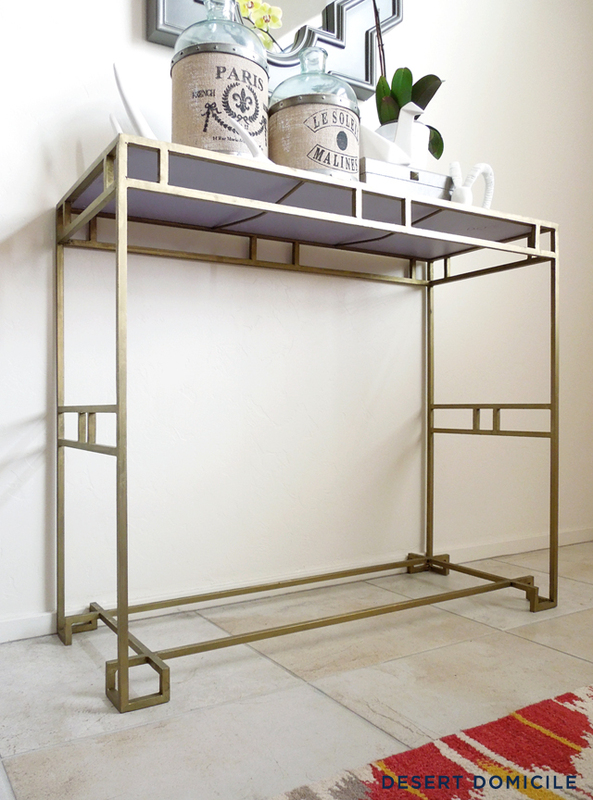 I was thinking about painting it a golden yellow (similar to the color in the rug) but was afraid that it'd compete too much with the gold console table. Burnt orange might look good though! I'm still drooling over that rug. Ah! 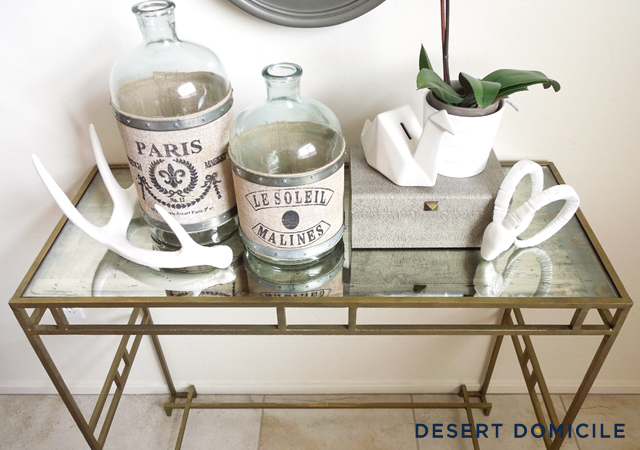 I LOVE that console table. And $200 for a $769 piece?! Amazing. 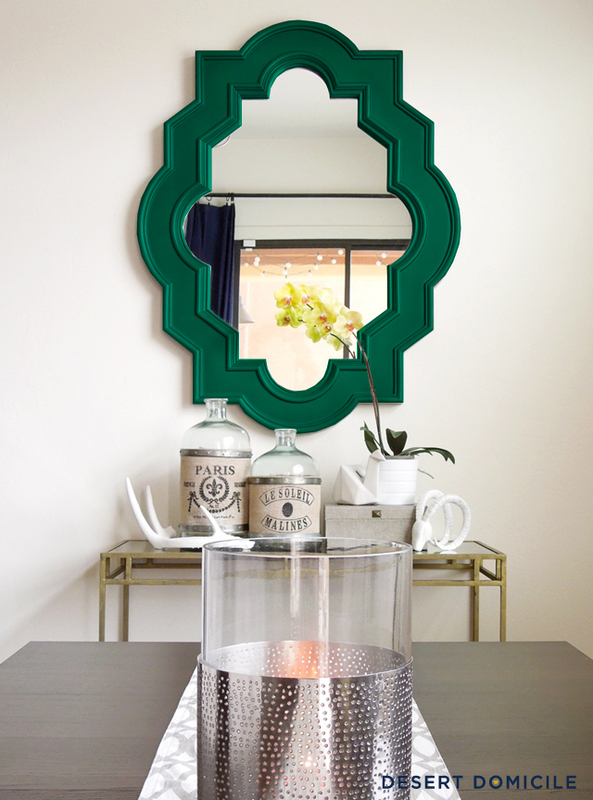 I think the quatrefoil mirror would look awesome painted emerald green. 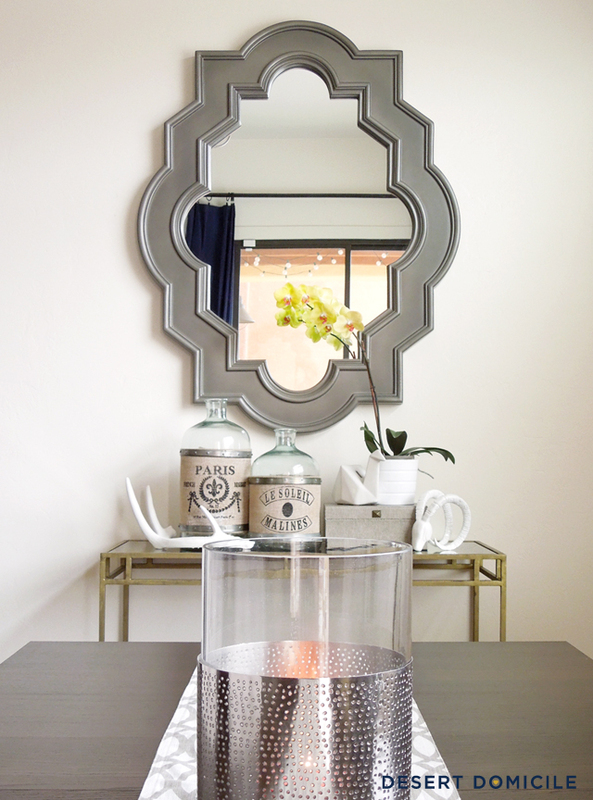 I've been looking for a quatrefoil mirror for a while since it's my sorority symbol. Lowe's has one for around $50. I just need to pull the trigger. Chelsea - I know, right?! I still can't get over the price haha I think I've seen that mirror at Lowe's! It's the Allen + Roth one, right? It seems really nice and you can't beat the price! I love the emerald green color option! Where did you get that great mirror??? I would love to put one in our basement! Also, the rug looks great in its new home! Love that you were able to use something that you already had! Thanks Julie! I got the mirror from HomeGoods over the weekend. It's identical to the Casbah mirror from Lamps Plus but it doesn't look like they sell that mirror anymore. Hopefully you can find one at your local HomeGoods! Did the one your purchased have a makers name on it? 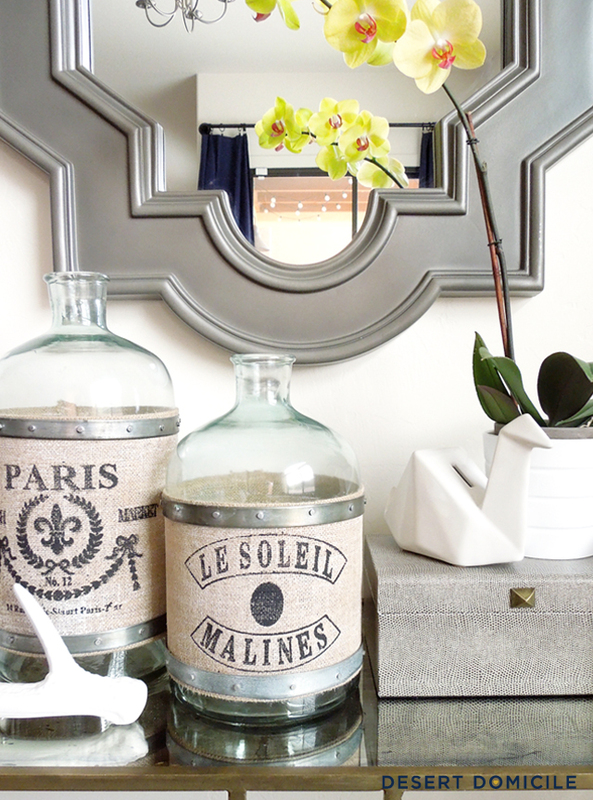 Of course these posts are older and I am just getting around to falling in love with this mirror!! LOL Thanks for any tips! I have been to tj maxx, marshalls, lowes, home goods, hobby lobby, ross etc.. no luck! Beautiful! I think I like the painted mirror pictures the best. That cart/side table is awesome!